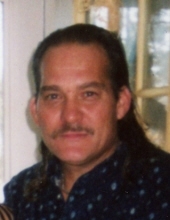 Chris Bowling, was born on February 7, 1960 in Georgetown, Ohio to Dealie (nee Jordan) Bowling and the late Joe Bowling, Sr. and passed away April 5, 2019 in Mt. Orab, Ohio at the age of 59. Chris is survived by his significant other, Judy Davidson, his children, Lloyd and Jimmy Bowling. His step-daughters, Melissa Stiles and Sarah Jacobs. Several Grandchildren and 2 Great-grandchildren. Also survived by his siblings, Crystal Davidson, Joe Bowling, Jr., Curtis and Sherman Bowling. In addition to his father, Chris was preceded in death by his sister, Teresa White. Chris was a Machinist for Giere Screw Machine and a resident of Mt. Orab, Ohio. A Visitation will be held on Monday, April 15, 2019 from 10:00 AM until 11:00 AM at the E.C. Nurre Funeral Home, 315 W. Plane Street, Bethel. "Email Address" would like to share the life celebration of Chris Bowling. Click on the "link" to go to share a favorite memory or leave a condolence message for the family.